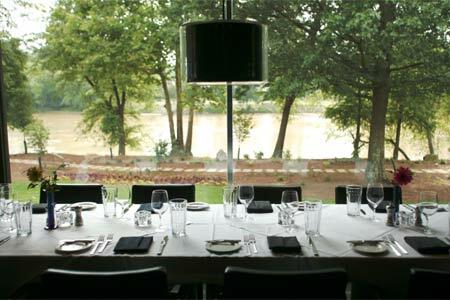 : Sitting on the banks of Atlanta's iconic Chattahoochee River, Ray's on the River captures wide-span views of the riverscape, while inside, the restaurant's multiple levels seem to give it a stage-like presence. Many fish choices change seasonally, but you can count on Georgia trout and grouper to be listed regularly. One may also encounter ginger-soy tuna paired with bok choy and shiitake mushroom jus. And don't forget to visit during salmon season. For carnivores, Ray's offers prime rib and hand-cut steaks, such as a New York strip or Delmonico, served with Yukon Gold mashed potatoes, and we've enjoyed the lamb chops, too. The cauliflower gratin is a first-rate side dish, but the creamed spinach swims in cream instead of being incorporated with it. End your meal with the Key lime pie or Praline Basket. The wine list captures a widespread collection, with heavy emphasis on California Chardonnay among whites, but more than a few French whites relieve the tedium. There are also a number of big spender business-account wines, such as Silver Oak, Beringer Reserve, Far Niente and Opus One. Live jazz plays at dinner most nights. Still family-focused, brunch (a buffet) probably is the best deal around; it's wickedly popular, so if that's of interest, show up early. Happy hour from 3 p.m.-6 p.m. Monday-Friday at the bar offers specially priced appetizers and drink specials.